As shown in the image below, diffuse light is associated with multiple scattering in dense spray and, therefore, will take a longer path and longer time to pass through the spray. With ballistic imaging, it is possible to use picosecond time gating to selectively image the straight or ballistic photons to enhance image contrast in a dense spray. In the example below, the image generated by ballistic photons will recover the internal structure of the otherwise opaque spray. Figure 1. Illustration of how ballistic photons take a straight path and a shorter time through a spray, creating a high-contrast shadowgram of the internal liquid structure despite interference from a cloud of droplets. Ballistic imaging in practice has been utilized to image the liquid core structures in a dense rocket spray, as shown below. The shadowgraph images are relatively opaque because the image is dominated by diffuse light that passes through the spray. With ballistic imaging, shown in the next panel, although the signal is much lower, the image contrast is superior because the contribution from diffuse light has been suppressed. Figure 2. Shadowgraph images in a dense spray with no time gating. Figure 3. Ballistic imaging with time gating to suppress diffuse light. A typical set-up for ballistic imaging is shown below. A femtosecond laser is used to image the spray so that even a small (picosecond) shift in the transit time of diffuse light through the spray can be differentiated from the ballistic photons. The image captured by the femtosecond beam is then passed through an optical Kerr-effect time gate that provides picosecond time resolution on the time gating. 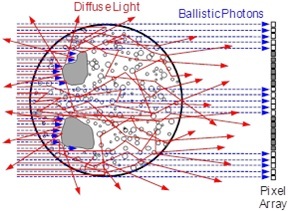 Such a system must be optimized for the typical transit time through a spray, and the technique is mostly applicable for dense spray conditions where the diffuse light is well separated from the ballistic photons. Figure 4. Schematic diagram of a typical ballistic imaging system.